Oh so pretty! I made this for someone who was looking for a wall letter to complete the nursery....created with Mod Podge of course! I sealed it with Sparkle Mod Podge; I love, love all the glitter...and sweet pearls. And a beautiful flower completes it! I now sell these in my Etsy Shoppe! Custom made with your choice of paper. My Vintage Whimsy paper was, again, the choice for this letter. I think it's so perfect for a baby girl's nursery! I love making these Custom Large Wall Letters...adding all the special little touches makes each one unique! One beautiful Mod Podged Chrismas box, ready! And now avalable in my Etsy Shoppe. In between my paintings (Which are lmost ready to be revealed! ), Etsy orders, and Plaid projects, I've decided to tackle, one by one, the pile of wood boxes I have collected over the years. I love the vintage style of this paper. I removed the pin backing off of this brooch I had and glued it on the top of the box. Perfect! This box is now available in my Etsy Shoppe. You can read more about the details of how I made this box in my listing information. I plan to add more Christmas boxes in my shoppe, one at a time. After playing around with several ideas in my sketch book, this was the idea I came up with for Joshua 24:15. As for me and my house we shall serve the Lord. I collaged the background with lots of text, hymnal pages, and handwritten prayers. I love scripture to peek through lots of layers. When that was done, I drew my subject. After some more detail work and quite a bit of shading of the hands, I added the verse which I hand painted and distressed to add to the grungy look I wanted. And it's done!...and now available in my Etsy Shoppe. I was inspired to make this piece since this was the summer for weddings. I wanted a unique personalized gift to give as gifts. So, I decided to mount the prints on wood and hand stamp the family name onto a plate of copper and nail it into the wood over the door. I also adhered a skeleton key on the door. I just love the rustic look. Well, it was a hit! All the new families that received it loved it. You can see images of a sample in my Etsy Shoppe (Link below). My prayer is that this art piece would be a constant reminder to serve the LORD by serving each other and others everyday. I think we all need this reminder! I know I do, daily! I hung the original in our home near our front door. This item is now available in my Etsy Shoppe. Mod Podge Monday: A Very Special Gift...Personalized Painting! This very special art piece was a gift I made for Jasmine, my precious granddaughter. Mod Podge was a key ingredient, but the main ingredient was love! There's lots of layers and it's all mounted on a piece of wood with Mod Podge, of course. Jasmine Faith Walton, our beautiful granddaughter was baptized while we were in FL. The best part was that my hubby, pop-pop, had the privilege of performing the Baptism ceremony. Very Special! I made this little charm bracelet for Jasmine to wear on her special day. God Bless you Jasmine Faith! ps. I sell these personalized paintings in my Etsy Shoppe. I can paint any name and add any text you wish! I made this one to go with a dress I was wearing while traveling. I just love all the blue/purple colors. The larger blue beads actually change color according to the light. love it! Lately I've been enjoying the look of brass...I love its pink tone. I already gave these two bracelets away as gifts. I plan on making more of these to sell in my Etsy Shoppe. and then decided to make a matching necklace, but I'm not so sure I like this one. I have a different idea. I might remake this one. I brought this one along and changed one of the stones out for a different one that lays nicer. It was really bugging me...sometimes I'm just too much of a perfectionist. Ugh! It's not always a good thing. Here's one I made and I just love the way it turned out and have worn it many times already. It goes with so many of my outfits. I've have a blast creating jewelry on our road trips. It seems most of the jewelry I make lately is either for a gift or for myself. Are you looking for a simple Mother's Day Project to make? I designed these Vintage Style Plates for Plaid which you can easily make these in one afternoon. Try using photographs instead of the silhouettes. you can find my complete instructions here. This is what I created for Vera! The birthday girl! This will go perfect in her room which is decorated in, of couse, purple and green. I designed this cute little Princess stool for Plaid a while back. Made with scrapbook papers and, of course, Mod Podge! You can download my complete instructions Here: Download Instructions for Little Princess Stool. Let me introduce you to the new little Princess in our family, my precious granddaughter Jasmine Faith. My son Keith giving Jasmine her first kiss. Jasmine was not even an hour old here. A beautiful family, Keith, Tara, and their first child, Jasmine Faith. Tara looks amazing for just giving birth! It was such a blessing to be able to be there for Jasmine's birth. It was really a miracle I didn't miss the plane from Atlanta to Ft. Lauderdale. My hubby was booking the flight while I frantically threw things in my suitcase. Within which seemed minutes, we were dashing out the door to race to the airport (after I fell down the stairs!). But, YIPPEE I made it, literally in the last second! My daughter and her three children came from central FLorida to meet their new cousin and niece. Here I am with my four beautiful grand kids! I made this trinket box which matches the hanger I also made for Jasmine, which I featured last week. I also sell these personalized boxes in my shop. I always make my grand kids special prayer blankets. Here is the one I made for Jasmine. I prayed for Jasmine with every square I cut and every stitch I sewed. I felt so close to her heart even before I met her. Next week I have a really fun tutorial to share with you, a Mixed-Media canvas piece, "Freedom". Is it Monday already? Wow! I just don't know where the days go. Mine have been spent designing more projects for Plaid among my own projects while my house is in desperate need of a good spring cleaning!...That's at the bottom of the list, which I can never seem to get to. Oh well, yes, playing in paint is just so much more fun! These wood hangers can be found at Michaels. So many possibilities! I added the little wooden heart and hung it on an eye hook. Here is the other side of the hanger. I just love this paper! Fit for a Princess! The other side of the heart...Oh yes! Jasmine is certainly a little princess xo. See all the sparkle? Yup, I used my favorite Mod Podge formula! Sparkle Mod Podge along with rhinestones, lace and a bit of iridescent tinsel yarn. I found a beautiful dress for Jasmine and tucked this hanger into the box I wrapped the dress in. I'll show you pictures of my precious little jasmine and the other things I made for her soon soon soon! Valentine Tags - Made with Lots of LOVE! and lots and lots of LOVE! A creation of lots of fun layers and beautiful textures! and who doesn't love little felt hearts? I garnished each tag with fun fibers! Now available in my Etsy Shoppe! 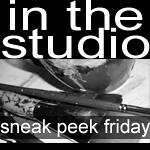 Linking up with my friend Jennifer at Studio JRU. She has an awesome heart garland tutorial this week. 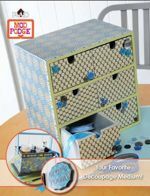 Mod Podge Monday: Decoupaged Vintage Trunk, my Goodwill Treasure!